You Now Have a Bookshelf! Related: we just updated our browse page to match the experience of the Bookshelf. Check it out! People who have liked this comment in the forum thread, You Now Have a Bookshelf! The bookshelf feature is very nice. It is nice to get a visual on what I have ordered, following, etc. Great! A lot of people have asked for this. I will check it when I get home. A couple things: the number of followers a book has is listed, but I don't so much care how many followers it has. I want to know how many orders a book has. Like a progress report. Second (not that this one will end up mattering much, I'm sure), Blood Dawn is listed on my shelf three times - probably because I ordered copies three separate times. Most people aren't going to be doing that, so it might not matter. Ok, one more thing - it would be nice to see how much more time a campaign has. Yes! This is very rad. Exactly what was needed. 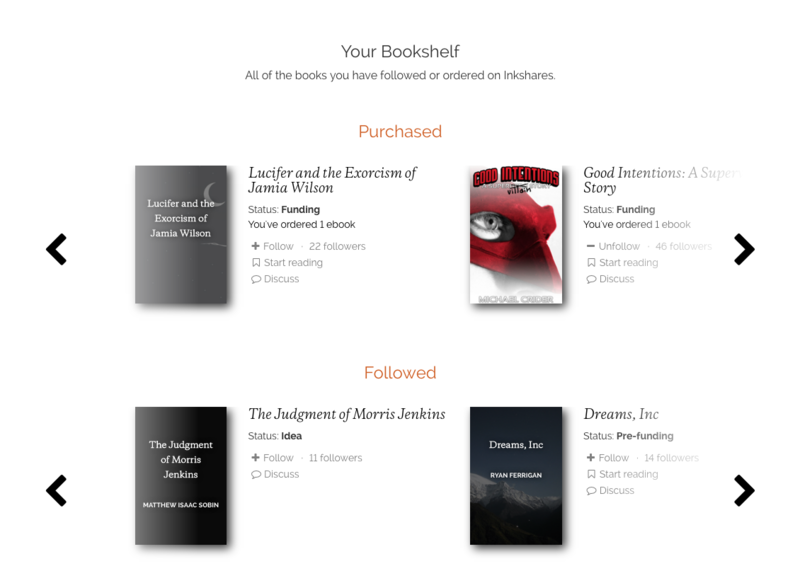 We've just added a "Bookshelf" to the user menu which takes you to a list of all the books you have ordered of followed. Give it a spin, let me know what you think!